Crack eggs into a large bowl, add milk and whisk lightly. Add sliced prosciutto, halved cherry tomatoes and crumbled feta to eggs along with spinach leaves and a good crack of pepper. Preheat grill on medium or oven on 190c. On stove, preheat a lightly oiled deep, oven proof non stick fry pan on medium. Add crushed garlic to pan and sauté. Add chopped prawns and cook for 30 seconds, while stirring. 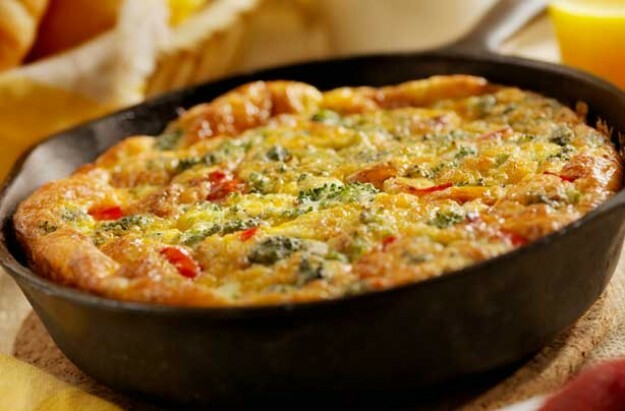 Pour in egg mix & cook for 6 to 8 minutes to allow bottom and sides to set. Transfer fry pan to grill or oven. Cook for a further 6 to 8 minutes, or until centre in set. Sprinkle with grated cheese and return to oven or grill to melt. Slice into wedges, serve with toasted thick crusty bread and sprinkle with chopped parsley and finely chopped chili.